Disclosure Policy | Management Policy | IR information | KAGA ELECTRONICS CO.,LTD. The basic policy of Kaga Electronics, as spelled out in our Group CSR Basic Policy, is that “The Kaga Electronics Group manages corporate information appropriately and discloses it in a fair and prompt manner. It additionally practices reliable financial reporting based on accurate accounting.” As such, we actively disclose information as part of our IR initiatives. Kaga Electronics practices timely information disclosure in keeping with the Financial Instruments and Exchange Act, other laws and ordinances, and the Rules Concerning Timely Disclosure of Corporate Information (“Timely Disclosure Rules”) set by the Tokyo Stock Exchange (TSE). Also, if there is information that is voluntary to disclose (“voluntary-disclosure information”) because it does not fall under legal and timely disclosure rules, but which could significantly affect investors’ investment decisions, we actively disclose such voluntary-disclosure information. Information that falls under the Timely Disclosure Rules (“timely-disclosure information”) is disclosed through the TDnet system provided by the TSE. After initial disclosure, we promptly provide timely-disclosure information to the news media and post it on our corporate website. 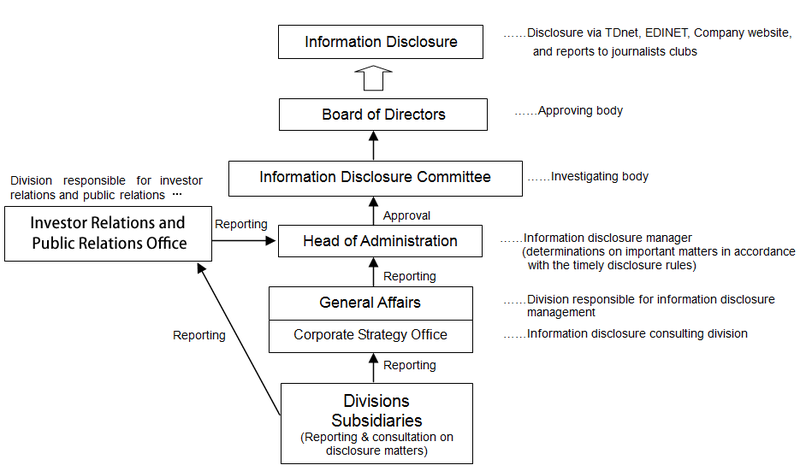 Also, if there is voluntary-disclosure information (information that does not fall under legal and timely disclosure rules) which could significantly affect investors’ investment decisions, we disclose it via the TDnet system, simultaneously promptly provide it to the news media, and post it on our corporate website. To ensure that investors outside Japan also receive timely and accurate information, we promptly post to our website English translations of timely-disclosure information and voluntary-disclosure information soon after it is disclosed in Japan. In addition, to ensure that Kaga Electronics disclosures reach a wide range of investors promptly, accurately, and fairly, we make arrangements so that information is conveyed through news media and institutional investors and analysts. When we announce our financial results twice a year (first-half financial results and term-end financial results), we hold press conferences for the news media and results briefing sessions for institutional investors and analysts, and we take great care with the information we release in our announcements. In addition, after holding our twice-yearly results briefing sessions, we promptly post video of the sessions to our website, and we also post materials giving an overview of financial results for each quarter. To prevent the leaking of financial results information, Kaga Electronics has established a “period of silence” from the day after the end of each accounting period until the day those financial results are officially announced. During that time, we do not make any comments on or reply to any inquiries about our financial results. If asked to disclose information on any item during the period of silence, we disclose it as appropriate. In addition to the revenue forecast contained in our financial results, Kaga Electronics may provide information concerning our future outlook. In addition, we may include giving our outlook and opinion to the media, during briefing sessions, in various reference materials, in question-and-answer sessions, etc. In each case, information concerning our outlook that is not a statement of past facts is based on judgments of Kaga Electronics at the time of preparation and these judgments were themselves based on certain assumptions. Therefore, actual earnings figures, results, etc. may vary from our outlook contained in disclosed information owing to future changes in business operations, economic conditions, etc.